If a bunch of rootin' tootin' varmints have been making trouble in your town, then it might be time for you to hire the best peacemaker around. Lucky for you, he lives right under your roof! Your little guy will be ready to ramble to the rescue of his community (and look pretty darned cute while doing so) in this Toddler Cowboy Costume. He’s been watching all the best old wild west flicks and fashioning makeshift cowboy hats out of anything he can find, so the time is right to strike gold with this winning outfit. 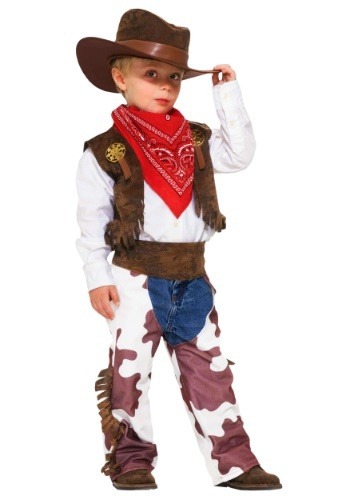 You don’t have to buy him his own bronco or anything, but don’t be surprised, once he dons this cowboy outfit, if you find him trying to ride the family dog around the backyard. Good thing Fido is still faster than your little tot! Because armed with these faux-hide, fringed, white-and-brown chaps and matching vest, he’s proving to be unstoppable out on the range. With the addition of this costume, you’re able to transform his everyday denim and white shirt into his ultimate fantasy! Add the adjustable waistband, red bandana, his trusty cowboy hat, and he's instantly got the kind of guts to take on any bandit. The best part about is, he's your child, so you'll only have to pay him in snacks to take care of a lawbreakers. Good luck, Fido!